This mens pinky ring has a 4mm center stone flanked by 3 2.5mm stones on each side. This one was 8mm wide at the top, but tapers down to 3.5mm wide. Those widths can be changed to your taste though. Do you have an idea for a pinky ring? Send it over an dlet us work our magic for you! ACCENTS: Around 7/8 TCW, depending on the size of the ring and stones. Depending on the size of the stones, there a wide variety of stone possible to use in this ring. 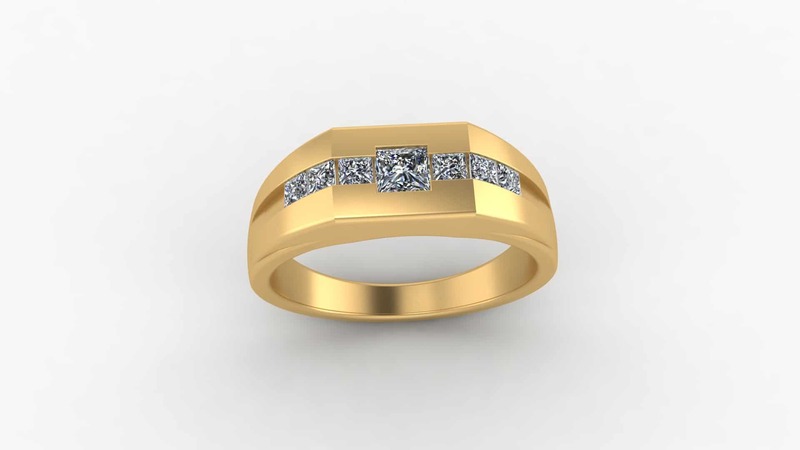 Click HERE to see another mens pinky ring style. Click HERE to learn more about custom jewelry, view our portfolio, or to contact us about a mens pinky ring. It can cost less than you think to have your very own custom men’s wedding band made just for you. Why settle for the lame and overpriced wedding rings from the retail stores when we can make something showing your style and personality?